While Apple's self-driving vehicle fleet is the most prominent element of its "Project Titan" research, the company is still working on other areas of the car, including improving the safety of passengers in a vehicle and a sunroof of its own design. 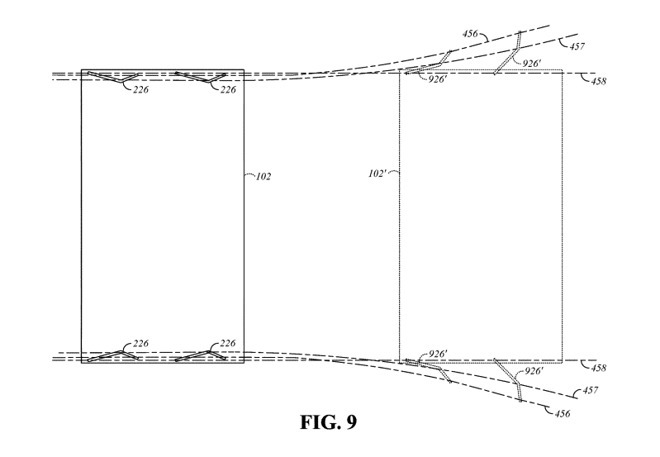 A pair of patents granted to Apple on Thursday cover two areas of the driving experience that are often overlooked. The first, titled "Movable panels with nonlinear tracks," describes a sunroof system that uses multiple tracks to slide a panel along the top of the vehicle. According to the patent, the system basically consists of two tracks and an arm that connects between both tracks and the panel. Of note is that the two tracks are not oriented the same way, with the difference in distance between the two affecting the arm's orientation, but still allowing all three components to stay connected. In the patent's drawings, it is proposed that the system would be useful for vehicles with a narrower roof towards the center of the car and a wider roof section towards the rear. This would allow for a panel as wide as the roof to be used, and in being slid back along the tracks, is kept towards the center line of the car, but at the rear. While drawings shown in the patent depict a car with a smooth rounded roof section, it is likely these are just to illustrate how the system would work in an ideal scenario. 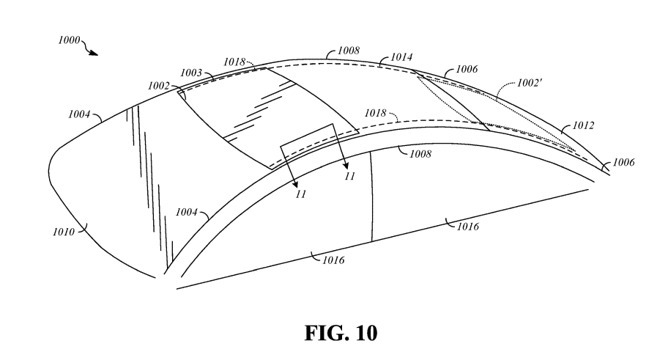 While Apple does include illustrations of its own products in demonstrating concepts in a patent, this should not be taken as a sign that Apple is designing a car with the shown style of roof, or with that specific sunroof track system. The second patent, "Haptic feedback for dynamic seating system," explores ways a vehicle could provide passengers with notifications of events via their seat. Rather than alerting users by beeps and visual cues, such as those used by systems to prevent lane drift, Apple suggests using the seat itself. By "dynamic seating system," Apple means a seat that can have one or more characteristics adjusted by the onboard computer. For example, this could include changing the height of the seat, the seat back angle, inflating or deflating seat cushions, or modifying the tension of a seatbelt. This is all performed based on data the onboard computer is receiving from external conditions, such as the potential risk to a passenger's life based on the vehicle's motion. In normal conditions, a simple vibration of the seat or a slight change in chair positioning could provoke a driver to pay attention, which Apple argues would be better due to it not providing a visual or audible distraction to the driver. For hazardous driving situations, such as poor weather or the use of a car's "sport" mode, the seats could alter its settings to put the passenger in a safer position and increase the tension on the seat belt. At the same time as improving safety, the altered seating would also serve as a warning to the driver to exercise caution while in motion. It is also noted that existing passive safety systems, such as pre-tensioners for seat belts or inflatable seat bolsters, typically only come into operation during a collision, and only once a collision has occurred. Depending on the situation, a car's sensors could detect an impact is imminent and quickly orient itself into a configuration to maximize safety, as well as triggering some safety mechanisms in advance. The patents form part of a large body of filings Apple has made with the USPTO relating to vehicles, with the bulk regarding more exotic topics, such as self-driving systems. One filing in August advised on how a self-driving car could alert other road users of its intentions, another in July concerned how a vehicle could change its driving style based on the observed stress of its passengers, and March filings covered gesture-based controls and other similar topics. Apple has long worked on "Project Titan" for some time, with it originally referring to a branded car until a 2016 change of focus to self-driving vehicle systems. Apple operates a fleet of vehicles for testing its autonomous driving project, and is believed to be working with Volkswagen on the PAIL program, which would ferry its employees between offices using self-driving vans. 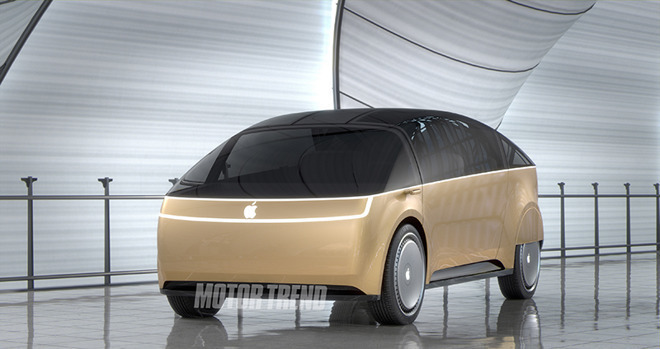 Apple could still be working on its own vehicle, with noted analyst Ming-Chi Kuo suggesting an "Apple Car" or related products could be usable by consumers as early as 2023.